Thousand Hills Hotel, Golf Resort and Conference Center is one of the providers of the best lodgings in Branson which offers unparalleled luxury, comfort and convenience for your spring vacation. Whether you choose centrally located condos near the popular 18-hole golf course or prefer to be alongside the lake or a log cabin in a secluded place, you are sure to enjoy great features that cannot easily be enjoyed at competing hotels and resorts. All three lodging properties of Thousand Hills feature indoor and outdoor swimming pools, an exercise facility and accommodation units loaded with special features. At Thousand Hills, it’s easy to see why the luxurious lodgings found at the Cabins at Grand Mountain are the most chosen accommodations. Beautifully located in an area with a rustic and romantic setting, the log cabins provide the whole family or intimate couple the perfect getaway backdrop. This cozy accommodation offers a variety of options for those in quest of relaxing atmosphere and calm environment with stunning scenery. These comfy lodgings in Branson is located just minutes from area attractions, two blocks north of 76 Country Music Boulevard – and yet, still nestled among the trees along the foothills of the Ozark Mountain. Staying at the cozy log cabins will let you experience a luxurious and comfortable living. You can choose among units from one bedroom, two-bedroom to four-bedroom which sleep from 2 to a maximum of 16 people. All the log cabins at Thousand Hills come with jetted tubs, fireplaces, fully-equipped kitchens, and screened front and back porches. 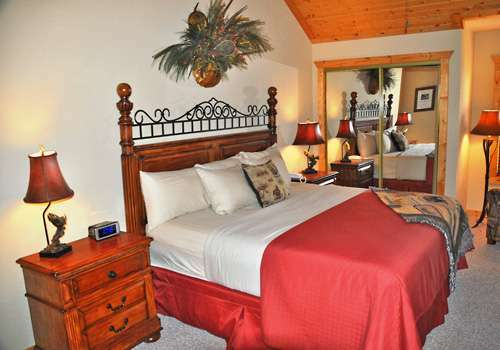 This beautifully decorated and well-appointed lodgings in Branson offer a singularly memorable vacation experience. Be sure your next spring vacation should be spent in one of the log cabins at Thousand Hills. Branson condos are another luxurious lodging units offered at Thousand Hills. This comfy accommodation will surpass your expectations with luxury, spacious room, great amenities from the moment you arrive. Thousand Hills offer a variety of options, from suits to much larger five-bedroom condominiums and townhouses. The location is convenient as it is near the heart of Branson and just a few feet from the popular 18-hole golf course in Branson. Ample parking is assured for all condo guests. The calm location makes you forget noisy city streets and feeling relaxed comes easy in this tranquil environment. While having a wonderful vacation at Thousand Hills and enjoying a spring getaway either in a cozy log cabin or in a comfy condo, you will find it so accessible to visit some of the best attractions in Branson. The Titanic Museum, White Water Park, Dolly Parton’s Dixie Stampede Dinner & Show, and the area’s favorite shopping destination, Branson Landing are within a few minutes drive from any of Thousand Hills Lodging choices. The convenient location of these lodgings in Branson provide all guests hassle-free routes to most city attractions. If you are looking for the best lodgings in Branson on your spring vacation, visit Thousand Hills Golf Resort as it offers different types of accommodations.